Son Heung-min's hopes of avoiding military service by securing Asian Games gold suffered a blow Friday as South Korea were stunned 2-1 by minnows Malaysia. The Tottenham Hotspur forward came off the bench just before the hour-mark but couldn't help the defending champions overturn a two-goal deficit, after Safawi Rasid's first-half double for 171st-ranked Malaysia. Son is skipping Premier League action for the regional Olympics, where victory would mean an exemption from South Korea's 21 months of military service. Son, 26, was released by Spurs for the tournament, which represents his final chance to avoid nearly two years in military barracks -- a serious setback to his career. South Korea, who thrashed Bahrain 6-0 in their opening match, dominated possession in the second half, particularly after Son's introduction, but were unable to claw their way back. 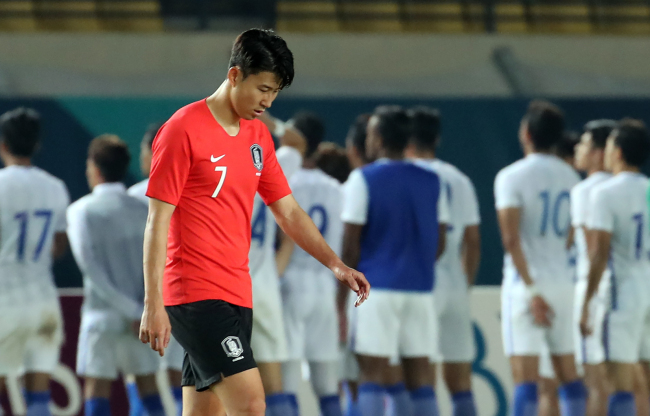 Japan-based striker Hwang Ui-jo, who is also facing his final chance to avoid military service, pulled one goal back for the Koreans late on. And Son had a golden chance to equalise with a free-kick just outside the box in the last minute, but he placed it inches wide of the post. Malaysia, 114 places lower than their opponents in the FIFA rankings, were happy to sit deep and play on the break, and frustrated the South Koreans further with frequent stoppages. Malaysia's Rasid opened the scoring after just five minutes and he cannoned his second in off the post in first-half injury time.